ANNVILLE (PA) – Delaware Valley University’s run to another postseason berth was recognized by the Middle Atlantic Conference (MAC) coaches on Tuesday as 14 Aggies were named to the all-conference team (seven first team, six second team, one honorable mention). Wynne and Lighty, who also serve as the team captains, are the lone DelVal players who also received all-MAC accolades in the past. For Wynne, the first-team all-conference honor is the third of his career as the safety led the team and finished fifth in the MAC in the regular season with 77 tackles. He will also take two forced fumbles, one sack and one blocked kick into the postseason. Lighty was a first-team pick for the second consecutive year. He notched a Division III-best six forced fumbles in the regular season and also placed third in the MAC and 18th in the country in sacks with 10.5 Lighty also has 48 tackles (13.5 for losses) to his credit. Bing has been a multiple threat on offense. He has carried the ball 41 times for 354 yards (8.6 avg) and five touchdowns. Through the air, Bing has hauled in 17 passes for 205 yards and one score. Ellis transferred in to DelVal prior to the season and has played a major role in the team’s use of three tailbacks in its running game. He has carried the ball just 95 times, but has netted 711 yards (7.5 avg) and five trips to the red zone. His average of 71.1 yards per game ranked fifth in the conference for the regular season. Fuller-Williams, who has scored eight rushing touchdowns, has also made his mark on special teams and placed second in the MAC in the regular season with an average of 23.9 yards per kickoff return (15 returns for 359 yards). Miller returned to the Aggies after a two-year stint in the service, and he has made an immediate impact in the secondary. The safety will enter the postseason with 57 tackles, three interceptions for 125 yards and one touchdown and a forced fumble. 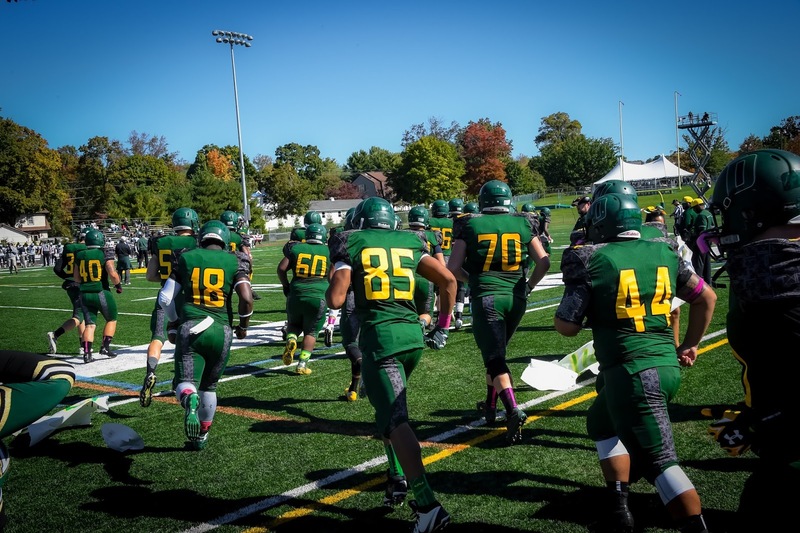 The score was a 100-yard return in a critical conference win over Stevenson. Norton bounced back after missing last year with an injury and has caught 11 passes for 133 yards from his tight end position. He has also played a key role as a blocker in a running game that is ranked 10th in the country with an average of 279.4 yards per game. Boyes and Ford have shined on the defensive line. Boyes, an end, has notched 40 tackles (6.5 for losses) to go along with two sacks and a fumble recovery. The 5-foot-10, 340-pound Ford clogs up the middle at his tackle position and has 24 tackles (2.5 for losses), one sack, one forced fumble and one fumble recovery to his credit. Cleveland and Reinhard are part of the standout Aggie backfield. Cleveland, a tailback, placed eighth in the MAC in the regular season with 541 yards on 101 carries (5.4 avg). He has reached the end zone two times. Reinhard, is mostly used as a blocker from his fullback position and has helped open holes for one of the top rushing attacks in the country. Joyce, a center, and Sylvester, a tackle, have both shined in their first year as starters on the offensive line. They have helped the offense average 26.4 points and 402.7 yards per game heading into the postseason. Marterella has made a smooth transition from wide receiver last year to cornerback in 2015. He has recorded 43 tackles and one interception while also leading the team with seven pass breakups. Delaware Valley ended the 2015 regular season with an 8-2 overall record, including a 7-2 mark in the conference. The Aggies will host Moravian College in the Inaugural Centennial-MAC Bowl Series this Saturday, November 21 (12:00 p.m.). It is the team’s 12th postseason berth in the last 13 years.